Clarence Wroblewski, former Band Director at Patterson High School passed away on November 22, 2018. Clarence was a man who for 35 years gave of his time, talent, patience, leadership, and skills to help mold thousands of young men and women. There are so many today touched by this music man. Mr. Clarence Wroblewski, a real life “Mr. Holland”, taught band and music at Patterson High School in Baltimore Maryland from 1951-1985. Over his long career as a teacher he directed, encouraged, mentored, and inspired legions of students, many who went into the music profession. Along with his wife Frances, who also taught at Patterson, he was known as one of the best teachers at the school and led the music program as chairman for many years. Scores of students were honored to have spent time under his guidance. Clarence Wroblewski was born in West Hazleton, Pennsylvania in 1924. He graduated from West Hazleton High School and entered West Chester State Teachers College. His time at the school was interrupted by service in the United States Army Corps of Engineers between 1943 and 1945. Wroblewski trained in Georgia and Louisiana before being deployed to the Philippines. After his discharge, Wroblewski returned to West Chester State Teachers College and completed his B.A. in 1947. He moved to Maryland where he taught elementary chorus and band in Chesapeake City in Cecil County. In 1949, he taught in Baltimore City at Highlandtown Elementary School before coming to teach at Patterson Park High School in 1951. During that time he completed his Masters in Arts from Teachers College, Columbia University. 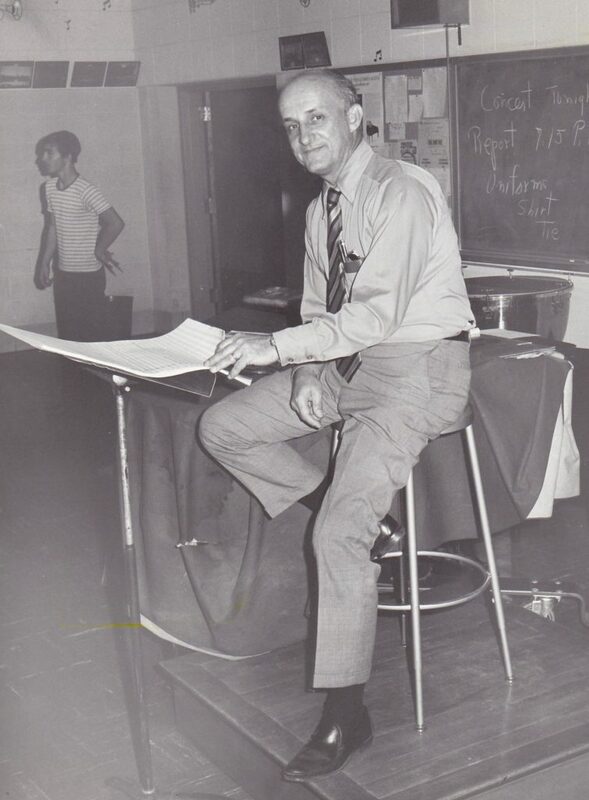 In 1960, when Patterson moved farther east to Kane Street he was responsible for moving the band library, instruments and uniforms to the new and larger facilities. Clarence’s main instrument was the clarinet, although he excelled at and taught brass, winds and percussion. While at Patterson Park, Clarence met Miss Frances Rankin, who taught business at the school, and they wed in April, 1957. They remained as co-workers at Patterson for the next 28 years. The Wroblewskis had four children and eight grandchildren. Music was not only his life at Patterson but also made up a good deal of his time outside the school walls. Mr. Wroblewski’s love of singing led him to direct the Lutnia Polish Chorus and the Chorus of the Chesapeake. He also played clarinet in the Baltimore Municipal and Baltimore Park Bands for decades and served as an assistant conductor of the Gettysburg Symphony Orchestra under Dr. William Sebastian Hart. Students always recognized with Mr. Wroblewski for many things. He never seemed to get angry at any situation and treated every student with respect. He would take time after school to work with anyone seeking help with music. On a much more personal note Mr. Wroblewski helped and encouraged me with my musical studies as I entered the Peabody Preparatory and Conservatory. He let me arrange a few things, explaining the basics of orchestration and encouraged me to play as much as possible. Along with great Baltimore City School teachers like Helen Bush, Hugh Carey, Taylor Harvey, Peggy Mullins (Friedman), and Robert Spangler I was well prepared to enter the music field. To them I owe everything. Here is a video tribute we put together for Mr. Wroblewski when we honored him for his service back in 2014. “He was one of the foundations of my own professional music career, because of my training under him. It led to my career,” said Jari Villanueva, a 23-year member of the U.S. Air Force Band who graduated from Patterson in 1973. Clarence Francis Wroblewski was born and raised in West Hazleton, Pa., the son John Wroblewski, a Polish immigrant who worked as a coal miner, and his wife, Mary Wroblewski, a bartender. After graduating in 1941 from West Hazleton High School, he began his college studies at West Chester State College in Pennsylvania. He left college in 1943 when he joined the Army Corps of Engineers and, after completing training in Georgia and Mississippi, was deployed to the Philippines and later Japan. After being discharged in 1945, he returned to West Chester State and received a bachelor’s degree in music education. In 1947, he began his teaching career in Chesapeake City Elementary School in Cecil County, instructing the chorus and band. Two years later he began teaching instrumental music at Highlandtown Elementary School, and in 1951 he joined the faculty of then-Patterson Park High School. He completed a master’s degree in music education in 1953 from Columbia University. He met his future wife at Patterson; she chaired the school business department. They were married in April 1957. During his 34-year career at Patterson, Mr. Wroblewski assembled a concert band, marching band and stage band. An accomplished pianist and clarinetist, he also excelled at and taught brass, winds and percussion. He said Mr. Wroblewski never got angry, but when a student was out of line, a certain look came over his face. “You knew that look, and I got it a lot,” he said, with a laugh. When Mr. Ziemann received his band letter, he found a note that Mr. Wroblewski had written on an index card. Mr. Wroblewski’s musical interests extended beyond East Baltimore. His love of singing led him to direct the Lutina Polish Chorus and the Chorus of the Chesapeake. He played clarinet in the Baltimore Municipal Park Band for decades and was assistant conductor of the Gettysburg Symphony Orchestra. In addition, he was the organist at the now-closed St. Gerard’s Roman Catholic Chapel in Highlandtown and was a supporter of the Baltimore Symphony Orchestra. After retiring in 1985, he continued teaching music and performing. He also enjoyed working in his garden, wood carving and was a regular Mr. Fix-It, his wife said. 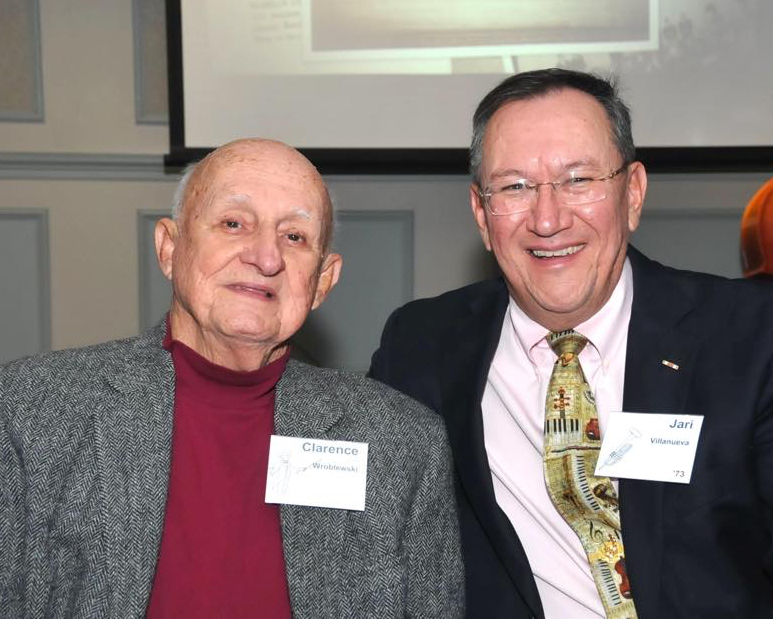 In 2014, Mr. Villanueva organized a reunion of Mr. Wroblewski’s students and friends, held at the 5th Regiment Armory. Many of his former students brought their instruments to form a band. At the conclusion of the celebration, Mr. Wroblewski was asked to conduct five pieces. He picked up the baton and, despite not having conducted for 30 years and being 91 years old, did so with “dignified composure,” his wife said. For more than 40 years, he was a communicant and Eucharistic minister at the Roman Catholic Shrine of the Sacred Heart, 1701 Regent Road, Mount Washington, where a Mass of Christian burial will be offered at 10 a.m. Friday. In addition to his wife and daughter, he is survived by three sons, Dr. Vincent P. Wroblewski of Lutherville, Michael S. Wroblewski of Washington and Dr. John J. Wroblewski of Santa Fe, N.M.; and eight grandchildren. This entry was posted on Wednesday, November 28th, 2018 at 8:23 am	and is filed under General Interest, History of Taps. You can follow any responses to this entry through the RSS 2.0 feed. You can leave a response, or trackback from your own site.